We’re in the bush, with loads of birds flittering around. Of course we’d want to attract and feed them so we can enjoy them up close. Naturally, we had some concerns about bigger animals getting to the feeders, damaging gardens or worse – finding better goodies in our sheds. Our overall plan: be smart and careful of anything we build. Soooooo….. It all started with an existing 10 foot tall (at least) steel post in the garden. We thought it would be a perfect “bird feeding station” so we bolted 3 hooks onto it and hung our feeders out. Surely no animals could get up that high! Well, we were right, no animal could get up that high, that’s why the bear bent the post over for his feast. Suddenly we had a 6 foot high post with one hook. That meant one feeder and we were committed to bringing the feeder in every night. One feeder just wasn’t enough though. So we started imagineering new ways of putting up feeders that maybe we wouldn’t have to bring in every night. It’s on a pretty thin branch WAY up high – the branch would be too thin to support anything at least as heavy as a raccoon. 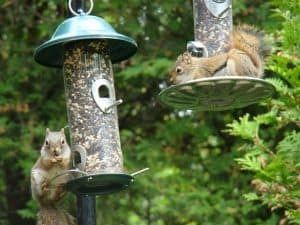 The squirrels quickly figured out how to get down the chain and park on the feeder for the day and we noticed some hefty scratches on the tree from something trying desperately to climb up for the feeder. So, that feeder came in for the night as well. Our quest for a feeder we can keep out safely continued although no more experiments were made. Time to think, think, think. We “thunked” for couple years before Brian came up with our latest contraption. It’s made of ABS pipe set in a concrete footing. The pipe is also filled with concrete. Some plumbing fittings, some holes drilled for perches and seed openings finish the unit off. So far it’s been in place for just over a week, no animals have tampered with it; the squirrels and chipmunks don’t seem to be able to climb it. Maybe the birds haven’t noticed THE NEW GIANT TOWER OF SEED in the garden. If they’ve noticed it, they haven’t had the nerve to try it yet. We’ve tried removing the other feeder – no birds came. We’ve set seed out on it – I think the wind just blew them off. Now we have another feeder (easy for the birds to see and land on) hanging off a perch on the new tower. According to an article I read on a birding website, it could take 2 hours, 2 days, 2 weeks or 2 months for birds to find a new feeder. We’ll see what happens! One week later.. they’ve found it! Brian had to make the holes a little bigger since the seed wasn’t dropping easily close enough to the holes for the birds to get their beaks in far enough. We’ve even had birds on it that we’re rarely see on any feeder before!